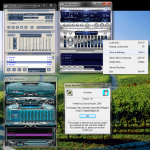 This Windows program shows classic Winamp skins in an explorer like view without having to select them in Winamp. This is useful, if you have a large collection of skins and don’t want to try them to find the right one, or if you want to get a handy preview. You do not need to have Winamp installed. The program can read wsz-(zip-)skins and skins, which are saved as a directory. WszView shows them (emulates Winamp) and can save a “screenshot” of the skin as a bitmap image file, so you can easily convert them and upload them to your homepage or share them with others. 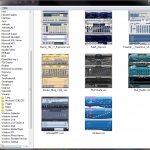 You can also select the skin in Winamp, which you are seeing in WszView, making it a more advanced skin selector. With standard explorer functionality, like deleting, you can use this tool as a complex skin manager. You can also add WszView to the shellmenu of wsz-files, which opens the skin in a single window, so you can access a preview from anywhere. WszView is copyright (c) by Sascha Hlusiak, 2001.